Area rugs have been around in some shape or form for literally thousands of years. In fact, area rugs have been covering the floors of human dwellings longer than you might imagine. The first rugs were actually animal skins which also in some cases may have doubled as a bed for the inhabitants of the dwelling. It wasn’t until much later that our ancestors figured out how to weave grasses and brushes to make mats. Then when sheep became domesticated, they learned to spin their wool into yarns and began using that to make rugs. Everything has its starting point and rugs are no different. The nomadic tribes of Asia began making rugs in large quantities sometime before 2000 BC. The Mongols wove pile-style rugs while the Persians were responsible for creating beautiful works of art. Around 1000 AD European rug weaving got its start. Rug making was influenced by the discovery of new materials and techniques by Marco Polo in the late 1200s in China. The best thing about area rugs is their versatility. They are super easy to install over any type of flooring and can be picked up and moved with ease. They can change the entire decorating scheme of a room in nothing flat with different color, texture, patterns and overall placement. Most of the rugs we find today in the “big box stores” are machine made rugs. They have very advanced design patterns that are all created on a computerized loom. These looms are even able to mimic the patterns found in handmade rugs. The benefit of machine made rugs is their affordability, making it so anyone that desires the look and feel of an area rug can make their dreams come true. Machine made rugs come in a variety of fiber types as well which include wool, silk, art silk, fiber blends, olefin (aka polypropylene) or nylon. Sometimes you can also find them in cotton or bamboo as well. Each of these materials all have their own characteristics when it comes to maintenance of the rug which we describe more later on. 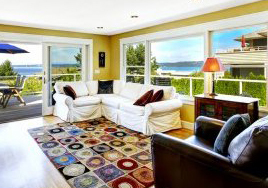 The higher end rugs are made of natural fibers such as wool and silk. The more affordable variety is typically heat-set olefin that frequently looks like wool.